Emotionally engaging, well written and superbly directed biopic, featuring a strong supporting cast and a terrific central performance by Sean Penn. Directed by Gus Van Sant, Milk stars Sean Penn as Harvey Milk, who became the first openly gay man to be voted into American public office before his assassination at the hands of fellow city supervisor Dan White (Josh Brolin) in 1978. The film begins in 1970, on Harvey's 40th birthday, as he begins a relationship with Scott Smith (James Franco), a younger man he meets on the New York subway. Two years later, Harvey quits his insurance job and moves to San Francisco's Castro Street, where he opens a camera store that quickly becomes the focus for the area's burgeoning gay community. Styling himself as the Mayor of Castro Street, Harvey repeatedly runs for the position of city supervisor, with help from young campaigners including perky street hustler Cleve Jones (Emile Hirsch). Penn is excellent as Harvey, delivering a warm-hearted, charismatic performance that will almost certainly land him an Oscar nomination later this week. There's also a trio of terrific supporting performances from Franco, Hirsch and Brolin, though Diego Luna's wildly over-the-top performance (as Harvey's flamboyant lover, Jack Lira) adds a jarring note that doesn't quite work. The decision to begin the film in 1970 means that the film largely avoids the usual biopic cliches and is free to explore some of the details in a little more depth, most notably, the elements that eventually led to Harvey's successful election (e.g. redrawn city boundaries, a subtle tweaking of Harvey's public image and a strong, community-focussed campaign). The script is superb throughout, refusing to demonise Brolin's character and also offering a disturbing reminder that the fight is far from over, with the parallels between the film's defeated Proposition Six (to ban all gay teachers) and California's recent adoption of Proposition Eight, which bans gay marriage in the state. 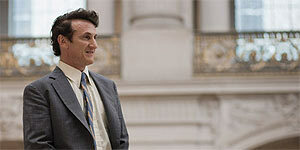 Milk is a superbly made, emotionally engaging biopic with a terrific performance by Sean Penn. Highly recommended.